One Pacific, located at 68 Smithe Street next to the Cambie Bridge recently approved final occupancy. The condo development by Concord Pacific has finally completed and with that came a flood of new listings to the market as seen when most buildings complete. You would think this would be your classic blueprint to riches in today’s Vancouver real estate market. Invest in a pre sale condo and in as little as a couple months later you assign it for profit. Or in this case, wait until closing and make an even bigger killing as seen with Telus Garden Resales Explode. However, this has not been the case for investors at One Pacific. There are currently 33 active/sold listings since the first one surfaced on July 16, 2016. Of those 33 only 3 have actually sold. There are some which are awaiting subject removal however many are sitting stagnant. Many have now been on the market for 3 weeks. It is a beautiful building and the condo market downtown remains hot despite Staggering Number Show Impact of Foreign Buyer Tax. The average asking price for One Pacific resales hovers around $1100/square foot. A hefty price to pay when there are so many options to choose from. However, the current price per square foot average for Yaletown sits at $1012. 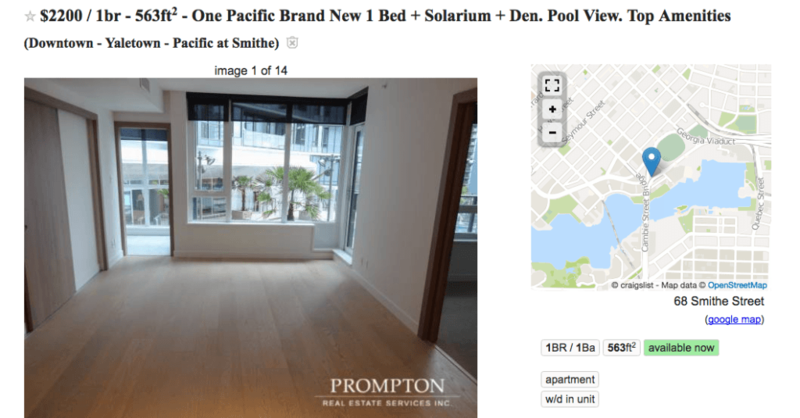 Not much less than what you would pay for a brand new unit at One Pacific. So what in the world is going on at One Pacific? A simple flooding of the market with too much to choose from in one particular building. Cannibalizing themselves. The longer listings sit there means there could be more wiggle room for potential buyers who are normally snapping up new builds. With more listings potentially coming on, sellers may want to turn to the rental pool. One Pacific is demanding some extremely high rents. Some one bedrooms can be found on Craigslist for up to $2200 for a 563 sq/ft unit. No parking included, you’ll have to pay extra for that. Don’t feel too bad for the sellers though. They’ve already made some impressive equity gains on paper; upwards of $200,000 since the pre sale in the fall of 2013. How Much Impact Has the Foreign Buyers Tax Had?